Star Trek: The Next Generation premiered in 1987 and followed the adventures of the U.S.S. Enterprise-D a century after The Original Series. 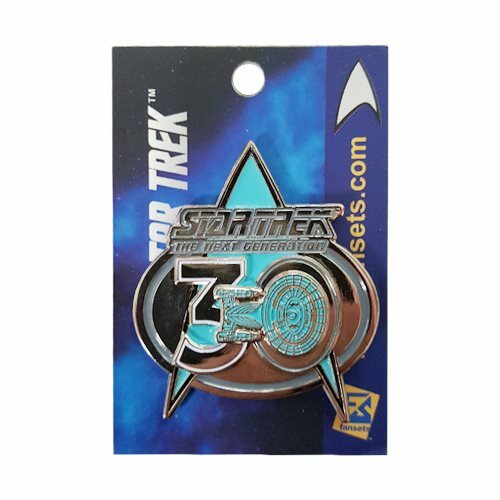 Celebrate the 30th anniversary of the show's premier with this Star Trek The Next Generation 30th Commemorative Badge Magnet Pin. Featuring the series' logo, the U.S.S. Enterprise is cleverly integrated into the badge show the series' 30th anniversary. The pin measures 2-inches and is also a magnet allowing you to put it in the fridge, your office or anywhere with a magnetic surface.